I started my journey down the path of sending and receiving Morse Code in the waning days of the winter of 2012-2013. During the month of March, 2013 I was getting help and encouragement from Hanz Busch, W1JSB and Jim Cluett, W1PID. On April 6, 2013 I made my first unofficial QSO with Bob Mayo, W2TAC. I say unofficial because I got lots of hands-on help from Jim during this QSO, who had come over to my house to help get me on the air. He actually heard Bob’s CW – I didn’t – and Jim had his hand on mine sending CW back to Bob. That’s not official in my opinion. I was nervous, full of anxiety and basically did a horrible job. But I survived. It was fun. I liked it. I wanted more. About a week later, I received a letter. The return address on the envelope was from someone in Petersburg, NY. What could be in the envelope I wondered? Uh oh! 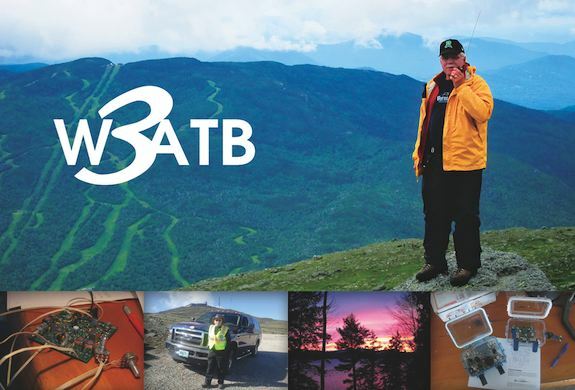 A QSL card from Bob Mayo! What am I going to do? 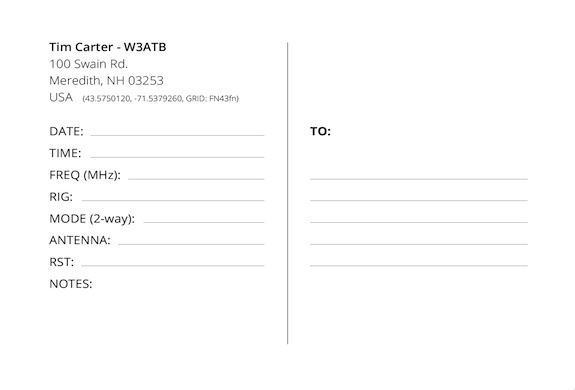 I don’t have any QSL cards of my own. Acccckkkkkkk! That day I started to research QSL card printing and printers! I immediately called my daughter Meghan who’s very good at creating all things visual. “Dad, send me some of your favorite photos of you doing ham radio. Make a sketch of the front and back how you envsion it. I need to know exactly what information you need on the back of the card. I’ll think of something,” quipped Meghan. After drawing up what I thought the card might look like, I took photos of my crude designs and sent them off to Meghan. Twenty-four hours later, she conjured up a magnificent front and back QSL card design that really communicates what I’m currently doing with amateur radio and where I believe I’m headed. Here’s the front of my QSL card. I was standing on the side of Mt. Washington working the Climb to the Clouds Auto Race in 2011. Here’s the back of my QSL card with all the data about any QSO made with another station. I’m really happy with my QSL cards. But now I have another problem. I ordered the cards online from a top QSL card printer – OvernightPrints.com. I used a promo code getting a significant discount for 1,000 cards. When you print that many, you really cut down on the cost per card. I became aware of the problem when the Fed Ex driver pulled down my driveway and opened the back of his truck. 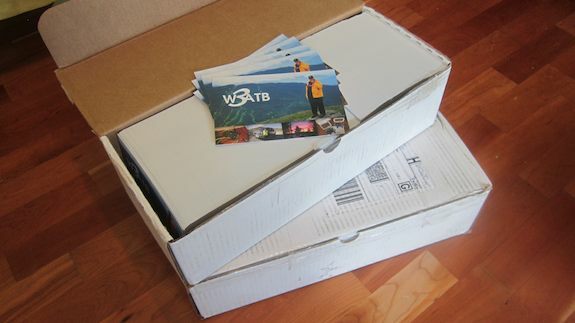 In his arms, as he walked towards me, were TWO boxes of QSL cards. Instead of getting 1,000 cards, I received 2,000 cards! I guess the machine operator at Overnight Prints got distracted or entered in the wrong amount to print. Here’s just under 2,000 QSL cards. I better get to work! But rest assured I only paid for 1,000 cards. It’s time to fire up the rig! I’ve got 1,999 cards to send out!